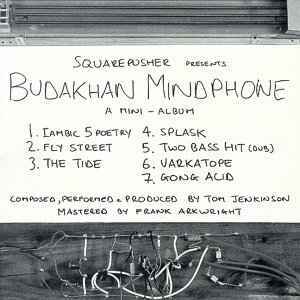 Squarepusher presents: Budakhan Mindphone "A mini-album"
Warp Music / EMI Music. Design by Tom Jenkins and Kleber. (P) 1999 Warp Records Ltd. Released under exclusive license to Nothing Records Limited Inc. There are some albums to buy for one song, and this could be one of those. It's not that the rest lack beauty, but that Iambic 5 Poetry is brilliant. This is a rare song which I can enjoy after hearing repeated for hours - the blend of drums, bass, chimes, electronics and spooky whispering feel like they should go on forever. You can focus on something different each time, thanks to the layering of sounds. Fly Street seems flat in direct comparison to Iambic 5 Poetry. The Tide is interesting, feeling quite cinematic, something from a spooky chase on foot through a foggy night in some metropolis. Splask feels like free jazz plus electronics, and doesn’t quite catch my ear. 2 Bass Hit (Dub) reminds me a lot of Primus, mostly due to the funky basswork. Varkatope is a really interesting track, with weird bass and creepy electronic keyboard type sounds. Gong Acid is comprised mostly of percussion, with minimal electronics in the background, sounding a bit like more traditional Japanese drumming to me for some reason. In the end, I keep coming back to Iambic 5 Poetry. The rest seem to rely on a single instrument or sound-set, none as beautifully complex as that first track. I’ll listen to the whole mini-album, but the first gets the most play from me.